This online calculator will estimate how much you will need to have saved by the time you retire in order to meet your monthly income goal -- with and without considering the effects inflation will have on your future buying power. Plus, the calculator will also tell you how much you will need to deposit each month in order to grow your retirement savings to the prescribed balance. Enter the amount you would like to withdraw from your retirement account each month. Enter as a dollar amount but without the dollar sign and any commas. Enter the annual percentage you expect to earn on your retirement investments. Enter as a percentage, but without the percent sign (for .07 or 7%, enter 7). Enter the number of years you would like to be able to make the monthly withdrawals from your retirement funds. Enter the expected annual rate of inflation between now and when you retire. Enter as a percentage, but without the percent sign (for .02 or 2%, enter 2). Enter how much you currently have in all of your retirement savings accounts combined. Enter as a dollar amount but without the dollar sign and any commas. 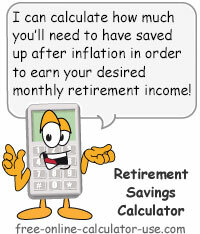 This online calculator will calculate the retirement savings needed in order to withdraw your desired monthly income for the duration of your life expectancy -- with and without accounting for inflation. While I agree that ignoring the effects of inflation in financial forecasting will likely result in a failure to achieve expectations, I also believe that building inflation into financial forecasting tools tends to discourage saving and encourage spending. When people see the difference inflation can make in their future financial condition, I'm willing to bet that many of them get so discouraged with all added sacrifices they will need to make in order to achieve their future goals, they simply decide to spend their money now -- while it's still worth something -- rather than saving it for the future when it will be worth much less. Yes, the effects of inflation are discouraging. However, in financial forecasting it's always best to estimate income low and expenses high. Because even more discouraging than seeing the effects inflation has on future savings, is to arrive at your future with no savings at all. My suggestion is this. Be sure to include inflation in your forecasts, but at the same time recognize that as inflation drives up the costs of goods and services, it also tends to put upward pressure on wages. So while your savings may be losing buying power each year, chances are good that your wages will also increase, which in turn means you should be able to increase the amount you are adding to your savings. If you want to hit the moon, shoot for the stars. Enter your current age and the age you plan to retire at. Enter the amount of your monthly retirement income goal. Enter the number of years you want your monthly retirement income to span. Enter the annual rate of inflation you expect will occur between now and when you retire. Enter the combined balance of all of your retirement saving accounts, if any. Tap the "Calculate Savings Need" button and scroll down to view the results.